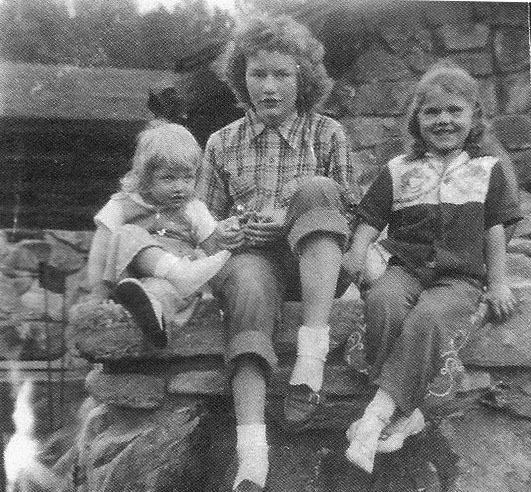 My sisters Betty, Patti and me, back in my pre-crush years. I remember being very proud that my legs had finally grown long enough to cross! Not too successfully, by the look of me. When I was very small, I was notorious for hating boys. My eleven-years-older sister once came into the living room and I was running around and around a big chair. “What are you doing?” she asked. “Chasing boys!” was my answer. My sister was at an age when “chasing boys” meant something else entirely, but she got my drift. When I was six, a lovely southern lady moved to town who enlivened the entire town. She taught ballet and acrobatics to the girls and square dancing to everyone age 6 to 76. This only lasted for a year or two, but twice a month most of the town would gather in the fairgrounds meeting room to do-se-do and alamand left. I was usually paired with a little boy who was in my first grade class. One night, after an especially invigorating “trade your partner,” when I was once again hand-in-hand with him, he gave me a big kiss. I can’t remember my reaction, but I certainly remember his mother’s. Abandoning her “trade your partner,” she came flying across the dance floor to shake her finger in his face. “Shame on you, Brian!” she said, “Shame on you!” (Not his real name.) She then grabbed him by the upper arm and jerked him off the dance floor to go sit in a chair by the wall. I was left without a partner and so had to dance with Will Prater, a grown man who was jerky and severe in his movements and who nearly dislocated my shoulder every time he swung me around. Brian’s mother’s fervor in upbraiding him worked. He never dated a girl, let alone kissed one, for his entire grade school and high school life. He did ask me to the prom my sophomore year, but unfortunately I had accepted a date with another boy the night before. By then I had a pretty big crush on him, fueled by his third grade tauntings of ‘Mayor’s daughter, mayor’s daughter,” when my dad was, indeed, mayor of the town, as well as a lifetime of torments in study hall, where he would break my pencils or pass me notes upbraiding me for scoring higher than he did on chemistry tests . In my town, teasing was foreplay, but unfortunately in this case, the foreplay led to nothing, since he never repeated his offer of a date, in spite of his dad’s best efforts. I knew he meant his own son, and had I not been in the throes of first lust with that “White River boy,” that would have been fine with me, as my longtime crush had continued. But, alas, Brian never heeded his dad’s hints, either, until my sophomore year in college when, both home for the summer from college in different states, he finally asked me out. There is no crush like the one where contact is long delayed. I remember one very hot and heavy kissing session before we both went back to our separate lives. We both married older people with children. Both became swamped in our own lives. I see him now and then at school reunions and of course crushes rarely survive a combination of reality and the passage of years. But everyone needs a first crush, and perhaps he doesn’t remember that I might have been his, but he has the distinction of being mine. I wonder if he would be surprised. I had a reading to go to this morning, where I read both “At 67” and “Once Upon a Lime in Mexico,” but you heard them both here first! “At 67” will also be published in Ojo del Lago, Mexico’s largest English Language newspaper/magazine, which is both in print and online. Before I left at 9:30 for the reading, I got part of today’s blog post finished and I completed it in the Walmart parking lot, where I’d gone to do a bit of shopping. Dreading the stop-and-go Semana Santa traffic, I decided to finish it so it would be ready for posting when I got home, which it is and I am!!! So, here goes. I’ve been trying to combine the NaPoWriMo and the WordPress prompts each day. The NaPoWriMo prompt today was to write a “fourteener” poem where each line consists of seven iambic feet (i.e., an unstressed syllable followed by a stressed syllable, times seven.) This form is also called a ballad. No topic was given, so I took a WordPress Prompt and went to a friend’s book and turned to page 11 and took the 11th word, which was “Should,” and started a poem entitled “She Should.” I later changed the title and the first line, so the words that started the poem no longer are part of it. The purpose of a prompt is to start, not serve as an end-all. So, here is my ballad. Please let me know what you think. to count on all her kin to provide everyone she meets. But this man has such lovely eyes, so what could be the harm? And she’s not often left to stray this far from father’s farm. When he walks by, she gives a smile and looks him in the eye. He looks away, but his shy smile still gives away the guy. She drops her basket, but he still continues on his way. It’s only then that she decides that this one must be gay. and yet she takes the longest way that leads there from her car. Although it should be blocks away, instead it is two miles. She only has this route and back to practice all her wiles. Her winsome smile becomes a grin, her walk becomes a prance. Some of the men seem to be shocked. The others move away. She’s sure it is just married men she meets this market day. But finally, one man in plaid does not avoid her glance. She smiles at him invitingly, afraid she’ll lose her chance. She sees him turn as she walks by and follow in her wake. It seems she’s finally hooked one. It was a piece of cake. When she arrives and goes into the store, he follows her. It’s just so he can meet her, of this she’s fairly sure. while he pretends he’s looking for food on which to sup. Pork and beans he passes up, chili and green beans. He adjusts his shoulders and hitches up his jeans. She knows that he’s not used to this. He’s not so debonair. and yet she sees him peeking when it seems that she’s not looking. It’s clear enough to her that something’s definitely cooking. yet a bull just gets right to it and a rooster never pauses. The action quickens in the aisle where the bread shelves start. She finally takes the upper hand and swerves into his cart. The metal baskets scrape and crash and make an awful din. She does not mind that people gawk. She finally has an in! takes her hand and flirts as he says, “Pardon,” very clearly. He turns and walks her down the aisle. It is a date, almost. that splits the aisle in two and makes them part, then join again. they make a handsome couple. She can see their wedding stills. She will pick the gown and flowers. He will pay the bills. When they approach the registers, he tells her to go first. They chat as the checker works. It almost seems rehearsed. He asks about her family and certainly seems rapt. The lives of mother, father, brother, sister clearly mapped. and all the while his pupils stay entirely dilated. sitting by her sister and wearing a blue hat. Her sister’s hat was yellow. He is sure of that. When she asks him home to supper, he says, “Yes,” in nothing flat. He talks to all her relatives and even holds the cat. he responds politely–he never even balks. but still the news of it does not set her heart to beating. with an unexpected ending. He was there to meet her sister! This entry was posted in Broken Love Affair, Daily Post, Disappointment, Family, family relationships, humorous poem, humorous poetry, Humorous Rhymes, Judy Dykstra-Brown poems, judy dykstra-brown poetry, Love, love poems, NaPoWriMo, Poem, Poems, Poems about families, Poems about women, Poetry, Sisters and tagged Daily Post, dating, Family relationships, funny poem, funny stories, humor NapoWriMo, Judy Dykstra-Brown poem, Judy Dykstra-Brown Poetry, love stories, NaPoWriMo 2015, poems about dating, Sisters on April 3, 2015 by lifelessons. Since today was still another free topic, I have chosen to take the Poets and Writers weekly prompt which is: The Flip Side—This week, think of something that has happened to you recently that was stressful, traumatic, or unpleasant. Write a poem about this event as you experienced it, regardless of anyone else’s perspectives or feelings on what occurred. Then rewrite the poem from the perspective of someone else involved in the situation. This new poem may not reflect the truth, but sometimes it’s important to remind ourselves that everything has a flip side. how can we see things so differently? this worrying and worrying of an old injury. of our changed love affair. will ever change that fact. I guess I must be that too. if it makes this easier for you. that I once warned you of. This entry was posted in After Midnight, Best Friends, Breathing Room, Broken Love Affairs, Daily Post, Daily Prompt, Dangerous Decisions, Disappointment, Healing, Loss, Love, Love Stories, Other kinds of Loss, Poetry by Prescription, Scars, Writing Challenge and tagged boken love affair, Daily Post, Daily Prompt, Different Loss, friends, healing, Judy Dykstra-Brown, Judy Dykstra-Brown Poetry, Loss, love, poem, Poems, Poetry, Poetry by prescription, Poets & Writers Weekly Poetry Prompt, scars, The Daily Post on October 2, 2014 by lifelessons. You Want Us to Write about What??? The Prompt: Voice Work—Your blog is about to be recorded into an audiobook. If you could choose anyone — from your grandma to Samuel L. Jackson — to narrate your posts, who would it be? This prompt is simply for the birds. It can be answered with two words! my blog if I were given the choice. My reasons, though, are somewhat murky. that seems to exclude piety. However, I think this won’t be. I doubt I could afford her fee! This entry was posted in Disappointment, Poem, Poetry and tagged Daily Post, Daily Prompt, Humor, humorous poetry, Judy Dykstra-Brown, Judy Dykstra-Brown Poetry, poem, Poems, Poetry, Poetry by prescription, The Daily Post on September 11, 2014 by lifelessons.